Succulent and Crazy flavorful, these Best Ever Dry Rub Chicken Wings are perfect addition to your game day menu. Either grilled or baked, you'll love them either way. Prepare Dry Rub recipe and set aside. Line a large glass plate with 2 layers of paper towels. Place wings on plate. With another set of paper towels pat dry the top of wings, removing excess moisture. Turn and repeat. Wings can be refrigerated in between paper towels for about 1 hour to help absorb excess moisture. Dip wings into dry rub, turning multiple times to ensure even coating. Place dipped wings onto a large platter. Preheat grill to medium heat, about 400℉ (takes about 10-15 mins). Once heated, place wings on grill plate closest to the heat. After about 10-12 mins turn wings and continue grilling for another 10 mins. Once 20 mins has elapsed, move wings to the coolest (top rack) area of grill and continue grilling for another 10 mins or until internal temperature reaches 165℉ making sure to not let the thermometer touch the bone. Pro Tip: Cook the wings with the lid closed but keep a close eye on not letting the temperature rise above 450℉. If temperature does climb above, open lid for a few minutes. The sugar in the dry rub will cause charring so moving the wings will help keep this to a minimal. Preheat oven to 400℉. Using sided cookie sheet with baking rack, place dry rubbed wings onto rack. Bake for approximately 30-40 mins or until internal temperature reads 165℉, making sure to turn wings halfway through baking. 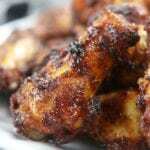 Serve wings with favorite dipping sauce or enjoy by themselves. 2 1/2 lb of wings serves 6 adults with 5-6 wings per person.